Social media is much more useful – and fun – with friends. 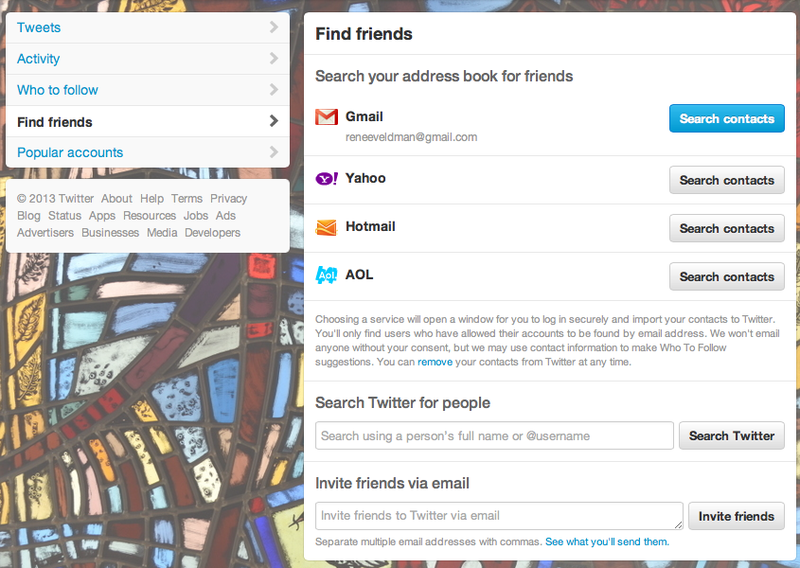 Twitter has a section where you can find friends using your email address book. However this is one of the biggest mistakes I’ve made in social media and here’s how you can avoid or correct it. In theory – a good idea. You need to first authorise Twitter to import your email addresses from Gmail, Yahoo, Hotmail or AOL. I did this with my Gmail account and had thought it would be a good way to let any of my connections who I wasn’t already linked to on Twitter to connect there. In practice – I’ve ended up spamming and annoying my friends and business connections. The problem is that Twitter don’t just send one invite….they keep hassling those people who haven’t joined on a regular basis. Nowhere can I find Twitter admitting how often and for how long, but I have had a contact write to tell me they have had several emails over the last month like the one above. Click on Find Friends on the left hand side and you will come to the screen below. Underneath AOL you will find some text. Click on the blue “remove”. It will tell you that doing so will make the “who to follow” less relevant. Sure. But it will also stop Twitter sending emails to those who don’t wish to receive them. Click on “remove contacts”. You’ll see a small black bar at the top saying “your contacts have been removed”. Done. I do find this just a little unsatisfying – I would have liked to have seen a list of the contacts they had been sending emails to, so I could see who I was unknowingly hassling. I suppose going to my contacts on Gmail could do that, but I wouldn’t know for sure exactly who was emailed and when. I just hope that now, I won’t be bothering friends and connections, both those who have taken the time to politely tell me (including my mum!) and those who have been quietly annoyed! Apologies if you were one. This may also be a co-incidence, but not long after I used this feature, my IP address was blocked from using Twitter. That’s a bit of a long story which I’ll save for another post. So the moral of this story? I think that using the finding friends feature on Twitter seems and easy way to build your followers – but is actually a bit of a lazy way and you risk annoying people. Instead, I’d recommend organically building followers – meaning connecting with others one-to-one, either via the Twitter icon on their websites, business cards or simply asking them when you speak in person if they use Twitter. I hope this post helps you avoid this social media mistake! This post is part of the Zestee Social Media School. If you’d like to learn how to use social media more effectively, take a look at our services page. Sign up for our enewsletter in the right hand column to receive monthly tips such as this. I hope you you didn’t spend too much time researching the issue. I wanted to add one comment to fill your readers in on a bit of irony about the whole situation. And that is that you and I are, in fact, already connected on Twitter. But because I have acquired multiple email accounts over the years (I probably use 5 or 6 regularly), and the one you have for me in your address book is different from the one associated with my Twitter account, Twitter does not recognize that we are already connected. 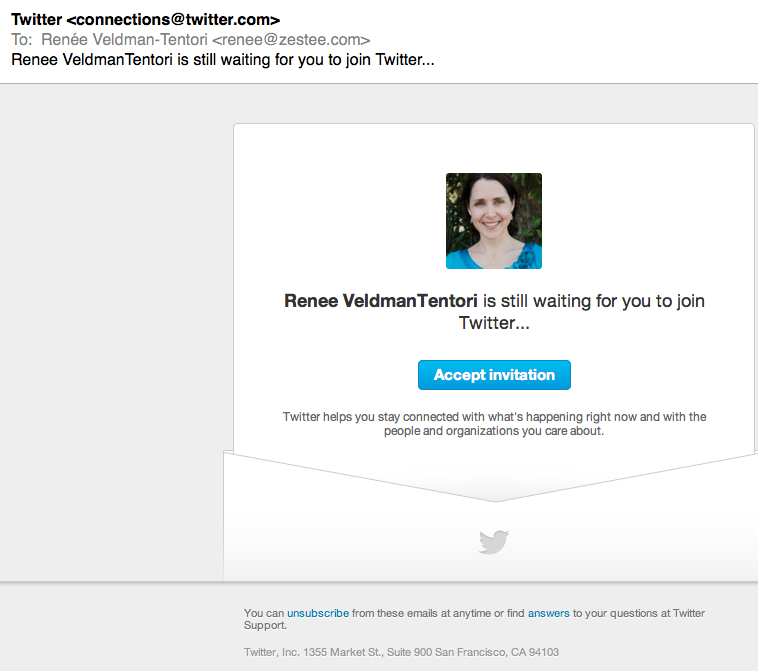 Thus you have Twitter sending emails to me (using the email address you have for me in your address book), telling me that you want to connect on Twitter and that I should join Twitter to connect with you. I point this out because a lot of people have multiple emails. And this situation probably happens quite often, even though the person who authorizes Twitter to access their address book is totally unaware of who or how often people are being contacted by Twitter. Thanks for finding the answer on how to stop the situation and for taking the time to write this post to make more people aware of the problem. Thanks for making me aware of this and let me know if you receive any more! Compliments for turning a terrible spamming experience into a usefull and interesting article! Thanks Anja, I hope you weren’t one of the ones I was hassling! Thanks so much for the article. I’m a newcomer to Twitter–I joined in order to invite folks to read my upcoming novel (Rainwood House Sings) but instead ended up inviting them all to Twitter! In a week it sent out 4 sets of reminders! Highly annoying, and I kept getting comments from my friends, who evidently aren’t as patient as yours. The thing even sent invites to cc’s on emails from friends, i.e., to folks who don’t know me at all–provoking even more annoyance. So, thanks again! This link is coming up very high in Google search. My key words were “twitter will not stop emailing my contacts” and yours was the first relevant link (LinkedIn had a similar problem.) THANK YOU so much for finding this fix; I’ve annoyed friends and foes, far and wide with “my” relentless email invites. Thanks so much for this article. I also have been inadvertently harassing my friends with multiple invites. Very annoying. And I previously searched for the answer to how to stop it and came up with nothing. I also contacted Twitter support and heard nothing. So if this works, I’ll be very pleased. Thanks. Thanks for taking the time to comment Luke, hope it helps! It was a life saver! Thank you!! Even I faced the same issue with twitter, always keep on sending reminders mainly to colleagues. THANK YOU. Before your post I only saw a solution that involved deleting something from settings within Twitter that clearly didn’t work. This invite feature is a travesty and has made me hate Twitter thoroughly. In my set-up haste I had allowed access to my contacts, but never expected that folks – and I mean EVERYONE from the 7 years I’ve had GMAIL – would be consistently harassed and annoyed by my smiling face, imploring them to join this irritatingly relentless social media mammoth. F.U. Twitter. I’ve been sending invitations for weeks now and to complete strangers to. My contact list also included business contacts, my local fast food restaurants, practically everyone I have ever emailed. The ones I feel most sorry for are those businesses that are behind a firewall and wont allow them to unsubscribe. I dont even remember doing it . . . Fingers crossed this stops now. I have the same problem. But when I hit the remove button It says: oops we are not abel to remove your contacts. This going on already for a month! I need some help form Twitter, but nobody cares! Hi Martin, thanks for your comment, it is frustrating isn’t it, and that must be further annoying that you can’t seem to stop it. This solution seemed to work for me but I had to search for some time to find it and also didn’t find too much in the help section in Twitter. Hope it can be fixed for you! Let us know if you do hear back from Twitter. Great information, thanks! However, I have experienced a different situation. I have 4 twitter accounts (biz, personal etc) and was continually getting ‘invitations to join twitter’ from newcomers who had me in their contacts list. I would then get perpetual follow-up invitations saying ‘ So and So is still waiting for you to join Twitter’. This was very annoying because I couldn’t find anywhere to acknowledge that I already had 4 accounts! 😉 after a few years I then noticed that at the very bottom of the invitation email Twitter finally added a ‘stop’ link which fixed the issue. Same thing happened to me. I just tried again and it worked the second time. Hopefully, you have found a solution! THANK YOU for writing this! I received a lot of angry emails and textmessages because of the Twitter Spam! Hi Eva, I’m glad it was helpful and hope it works! I was very excited about setting up my website and my Twitter account. I was appalled and couldn’t sleep after selecting the option to invite my gmail contacts. There’s many people in my contacts that I wouldn’t even want to connect with! Thanks so much for providing the really easy to follow instructions. I did it within 2 minutes! You can get these invites even if you don’t have a Twitter account. In that case it will be an invite to “join twitter” by a friend. And, you can get them repeatedly. LinkedIn also used to do this, which I now unconditionally block because they became really annoying. LinkedIn would collect people’s contact list and spam invites repeatedly to the whole list. Also, spammers have been known to send fake invites such as these to get you to click on a link that will infect your computer.